So often I look at the dreadful status of the world around me and sigh and wish that I could change things in a significant way. This moves me to join with organizations that are making a difference either through participation or through contribution. That is not a brag… I’m far away from being able to brag about myself in this matter. I wonder how often we fail to make a difference in the world because we’re always looking at some IMMENSE problem that demands a GIANT solution? What if we could change the world in one minute or less in a simple way? Depending on your experience with Twitter, you may know that thousands of tweets float by in the universe every hour and you won’t see the vast majority of them. But sometimes they catch your eye. At the time Ashley had 66,000 followers. Enough of them saw and retweeted so that this simple suggestion began to grow wings. By now that tweet has been retweeted more than 13,000 times. Every time it is catching someone’s eyes. The Today Show ran with the story and you can read some of the amazing results of this tweet HERE. What touches your heart? What is it that catches your breath when you hear about it? I’ve been blessed to know a number of these influencers. One person I’ve never met in real life but who has had a great influence in my world is Mike Ellis. He’s one of those who doesn’t let anything keep him from reaching out and helping others. Another world changer is Aaron Reddin who was inspired to love the homeless people of Little Rock. His world changing idea was to buy a van and stock it with stuff the homeless need and take it to them. This has grown as others have gotten on board. Or Mike Baumgartner who refurbished an RV and turned it into a kitchen and goes where disaster strikes to make food for victims and helpers…and this has also evolved. Quincy Gardner has gathered around him an army of helpers who come to the aid of people truly in need. Stack of Cards from Love in the Mail Group! 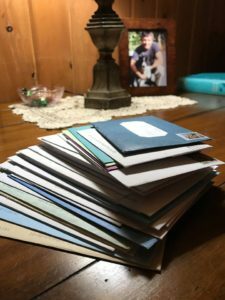 I once had an idea that if I could get 100 people to agree to send 1 card with 1 dollar to 1 person per week that we could change the lives of 52 people per year. So I started a group on Facebook called Love in the Mail. We’ve sent cards and dollars to over 100 people now. We still don’t have 100 participants, hovering around 70. But to me that’s a simple plan, a simple idea, that makes a big difference. Let me know if you want to join in! The one thing all of these people have in common in the beginning is that they had an idea of a way to help someone and they just put it out there. There is, in most people, a heart of compassion that needs an outlet. So what idea have you had that might change the world in one minute? Why not just tweet it out or share it on Facebook or call a friend and ask if they want to join in? I have a little project right now that I’m about to ask some friends to join in and help. Maybe I can help change someone’s world in one minute. I’ll be watching for your world-changing idea! What if we could change the world in one minute or less in a simple way? I’m working with Mike Baumgartner right now in Canton, Tx. I previously worked in Fairdale, Illinois with him. I plan on volunteering with Disaster Assistance whenever I can!!! We are almost to 150 people being blessed by LiTM. <3 Thank you for starting that wonderful ministry.